By now, you’ve head of Rat Lungworm (RLW) disease which has been a high-profile story reported by the local, national and international news media. 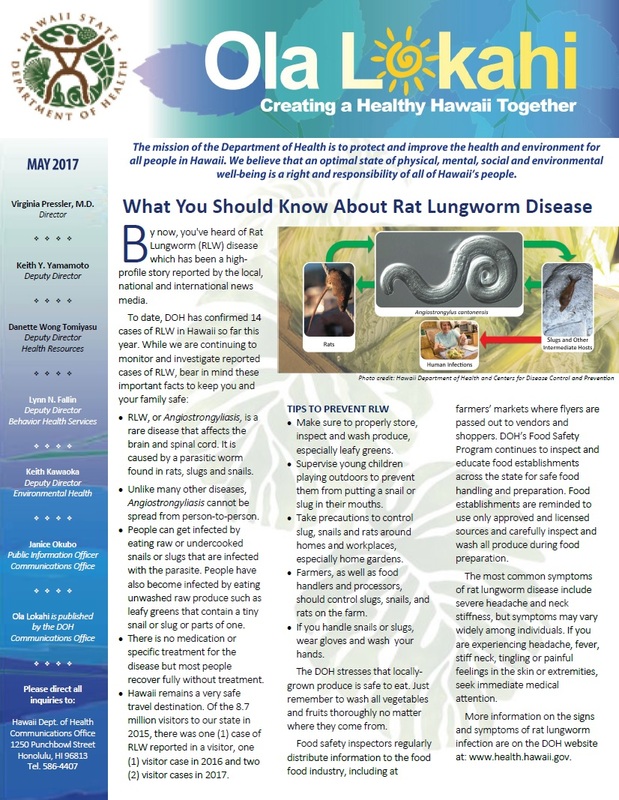 To date, DOH has confirmed 14 cases of RLW in Hawaii so far this year. Open the attached newsletter pdf to read more. The State DOH has announced that Dr. Elizabeth MacNeill is Hawaii’s new Tuberculosis (TB) Control Branch Chief. Dr. MacNeill has been with the TB Control Branch for the past seven years and has functioned as the TB Branch Chief on numerous occasions. Open the attached newsletter pdf to read more. While much of the debate at the 2017 Legislative session focused on the financially-troubled rail project, there were also measures that directly affected the Hawaii Departmento of Health. Open the attached newsletter pdf to read more. The State DOH is investigating an increasing number of cases of mumps infection statewide. Open the attached newsletter pdf to read more the cases statewide.